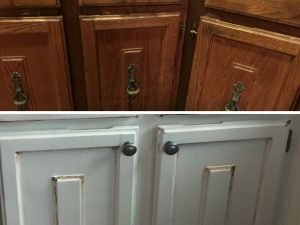 After years of staring at outdated brown wood, this homeowner knew she had to do something with her cabinets. And fast! LaffCo. Painting was called out to Bensalem to help transform a kitchen’s look while staying on a very tight budget. The homeowner didn’t want to spend the money on brand new cabinets, but was tired of the look of boring brown wood in her kitchen. LaffCo. provided the homeowner with her free quote, and guaranteed that the project could be completed for less than $2,000. That was all she needed to hear, and we were able to start work on the cabinets. We removed the old handles and filled all of the holes left from screws. New holes were drilled for more modern brushed steel knobs. All of the wood doors and bases were oil primed and sanded in between coats. With the primer dried, we applied three coats of SuperPaint Semi Gloss in color Creamy from Sherwin Williams. To give the cabinets an antique look that fit the rest of the décor, we applied Gel Stain by Minwax to the cabinet edges. The results are remarkable, and the client couldn’t believe how easy it was to give her kitchen a new look while staying under budget. Another happy customer was added to our books! Click here for your free cabinet painting quote from LaffCo. Painting.